Create a feeding haven for small, suet-loving birds using the Erva Copper Caged Double Suet Feeder. Placing this generous, hardy unit in your garden not only brings dramatic color to the area, it also offers suet to a few specific bird species. A significant, 14" diameter top and base add bold color to your yard, thanks to their copper tone, enhanced even more by the scalloped pattern and brushed finish. Black, 1.5" square mesh connects the top and base, and a suet feeder rests in the center of the assembly. This holder accommodates 2 standard suet or seed cakes, and its open top makes refilling this area simple. Small birds such as nuthatches and chickadees can easily enter this caged area through the 1.5" square openings, while larger birds often are excluded. The plastic coated cable allows the item to hang from a bracket easily, and its unique, moveable clamp secures the roof to the top of the reservoir. The full item disassembles for in-depth cleaning, and its all metal construction remains durable for many seasons. 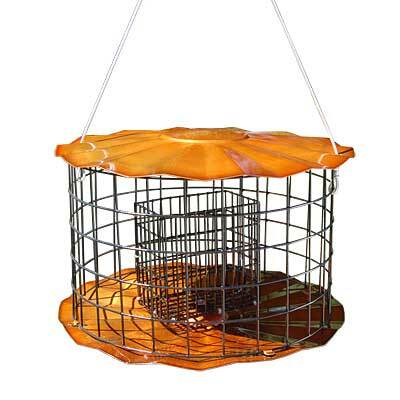 Provide suet to just a few types of birds with this Copper Caged Double Suet Feeder. Made in the USA.